Outlook 2010 and newer will check messages for a blank subject automatically, a macro is not needed. Surprisingly, some users hate this but there is no way to disable it in Outlook Options. If want to disable this warning, you can disable the warning using a macro. Anyone using Outlook 2007 or older who wants a warning when the subject line is blank needs to use a macro. 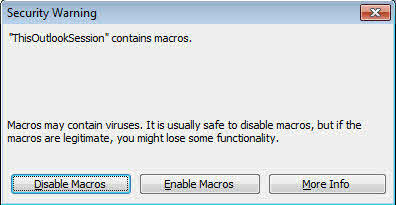 Step 1: Enable macros in Tools, Macro Security or Tools, Trust Center (Outlook 2007). We recommend the 'warn for all macros' setting (Medium in Outlook 2003 and older). With this enabled, you'll need to allow macros each time you start Outlook. In older versions of Outlook, you may need to close and restart Outlook before the macros will work. Step 2: Open the VBA Editor using Alt+F11 keystroke. 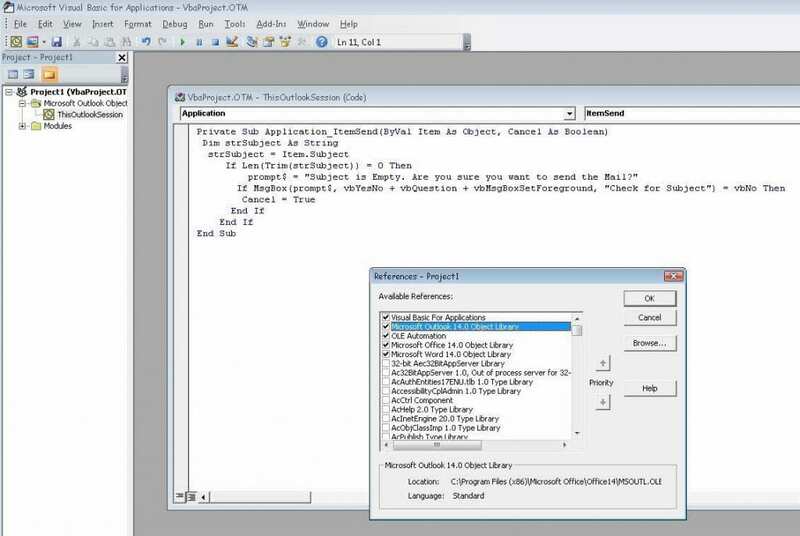 Step 4: Copy and paste the macro into ThisOutlookSession. The text should be blue, green and black. Red text means there is a syntax error in that line. Step 5: Save (Ctrl+S or Save button). Note: you'll need to save the VBA project when you close Outlook too. Test the macro by sending a message with a blank subject. Prompt$ = "Are you sure you want to send this message?" getting an error, it just seems to not run the macro. Windows 7 Office 2010.
it definitely won't show in the macro list (first screen shot) - it's an auto macro and will run when you send a message. You don't need to do anything to make it run (but click Send). Thank you for responding and for your help, I really appreciate it. changing the fourth line… it’s driving me a little nutty. Now wait a minute - why do you need this with either outlook 2010 or 2016? It has the warning built in - you should get this dialog box. If you also use the macro, it will come up after this one. oh, i see the problem - len is length. I created a request form with fields for users to enter in Outlook. However, I would like all the fields to be entered prior to the form getting sent. How can I prompt a message box stating "Please enter all the fields" when the user is trying to send the form with one or more blank fields? 1.Is there is way to add any prompt on recieving any mail in Outlook.For exaple. Do you want to archieve this mail. 2.On Yes, I want to use our own Product calls to archieve emails in repository. 3. Once Archieved , Flag of mail should be marked stating that mail has been archieved in repository.? Do you want the prompt as the mail arrives? if so, an itemadd macro can do the prompt and the flag. Whether it can use your archiving software depends on the software. I use a template in outlook 2007 where I need to edit the subject every time before I send it. In the template, the subject is "Ticket #". What is the code to get a prompt before sending out a message with a specific subject? I want it to warn me if I forget to edit the subject of the template. So If the subject = "Ticket #" then prompt me if I want to send out the email. use this - first 8 characters = ticket # to prompt for all messages that begin with ticket #. if you wanted to warn only if there was not something after ticket #, use the second one, 10 would allow for 2 digit or larger ticket #. That can be increased. I would like to applaud you for following up on comments from an almost three yr old post! I am trying to modify a subject to apply some leading text (to encrypt via our servers) to emails sent to any address besides two specific ones. I modified the code based off something I found online a while ago to just add the encrypt text to everything, but it gets kind of messy with some people's filters. Below is the code, any thoughts how to fix it? Thank you in advance! The macro at https://www.slipstick.com/developer/code-samples/add-secure-message-subject-sending/ uses a cleaner method if you need to exclude multiple domains and also check all of the recipient addresses. These could be combined into an OR... but the else works too. just exit sub and send if the statement is true. That was prefect. Thank you! Is there a way to add if the address is an Exchange address, as those do not show domains? Thank you! So you want it to trigger for any internal email address? Try looking for /ou in the address or "" (nothing). if that fails, you couls look up the pr_smpt_address - 'Check for different domains' macro at https://www.slipstick.com/how-to-outlook/prevent-sending-messages-to-wrong-email-address/ shows how. can you help me with the code for warning message "Please read the email or check the attachment before sending"
if you want to check all mail, remove the If and End if lines. Change the text within the prompt string. If I just want a macro to stop any and every email before I send it so I can check it one more time, what would I do? I'm not checking for a specific field. Rather, I simply want a "speed bump" with text in the pop up that makes me reconsider sending it or allows me to cancel if I'm not sure. I've done this before, looking at your site (I think) but I've forgotten now that I switched to a new computer. If you remove the IF and end if lines, it'll check all messages. I want to create a Macro in outlook 2013. If I am attaching anything in email then a popup box should appear with the statement “You are attaching a file. Please check if XYZ field available in the file” Presse YES or NO. Also in the popup box should be one check box If I checked the button then a note should be include with the email. Please help me to solved this out. That one is complicated and I don't have any macro samples that do that. Sorry.